For very frequent flyers, benefits like priority boarding, free checked bags and bonus miles are part of the typical travel experience. These extras come with having earned elite status on loyalty programmes run by the airlines. But what about everyone else? The occasional traveller can benefit from these offerings as well, assuming the airlines give them that opportunity. For many airlines a branded credit card is the gateway to free bags or getting closer to the front of the boarding line. American Airlines is pushing beyond credit cards, rebundling the unbundled services and introducing them directly into the booking flow. In many cases passengers can save some money and get benefits quite similar to elite status on an ad hoc basis. American’s new ‘Choices’ programme adds two new bundle options to the lowest economy fare – Choice Essential and Choice Plus. 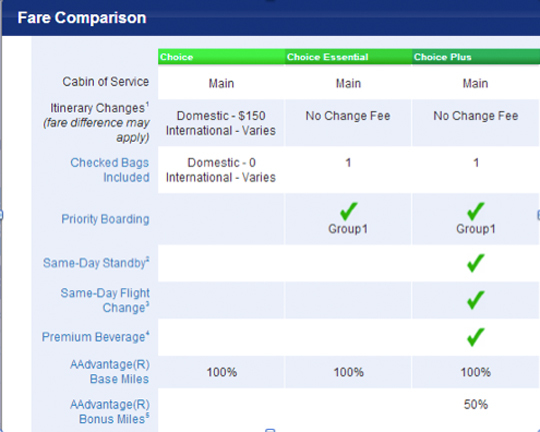 The three options all carry the same underlying fare basis, but they vary in price up to $44 each direction. The additional fee gets passengers a variety of ancillary benefits. Purchased separately the one checked bag and priority boarding would come to the same price as the Choice Essential option. American’s approach, however, puts the pricing directly in the booking path rather than having the customer find the details elsewhere. Additionally, American is pushing the package via its global distribution system (GDS) and Direct Connect partnerships; it will be bookable through third party channels such as corporate booking agencies. The Choice Plus option is only $10 more in each direction and the pricing is no longer linear to the specific benefits offered. The bonus miles would normally cost about $30/1000. With 50% bonus miles on the distance flown for only $10 extra pretty much any trip makes that a decent buy. The ability to have same-day standby fee waived is one of the benefits normally reserved for elite status holders in American’s AAdvantage programme. And the free drink is a benefit offered to Executive Platinum members, the highest tier in that programme. All elite members also receive bonus miles in the AAdvantage programme; the Choice Plus option adds that in for paying passengers as well. Of course, the opportunity to buy additional miles has been available for some time through the Mileage Multiplier option but, once again, the Choice bundles add visibility and will likely increase the purchase frequency. Two specific benefits included in the Choice bundles that are not available even to AAdvantage Elites are fee-free itinerary changes and confirmed same-day changes. Those might be enough to entice the elites to buy the options. Otherwise this programme is mostly about making a pseudo-elite tier accessible on a per-trip basis. And, much as the ancillary fee approach can frustrate customers, the bundled packages often make them easier to stomach.